You're possibly looking at these photographs a little confused, but whilst the lovely Charissa is away on holiday is Venice (me, jealous? 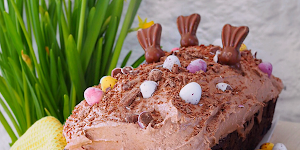 noooo) she asked whether I'd like to do a guest post and I was quick to say yes. 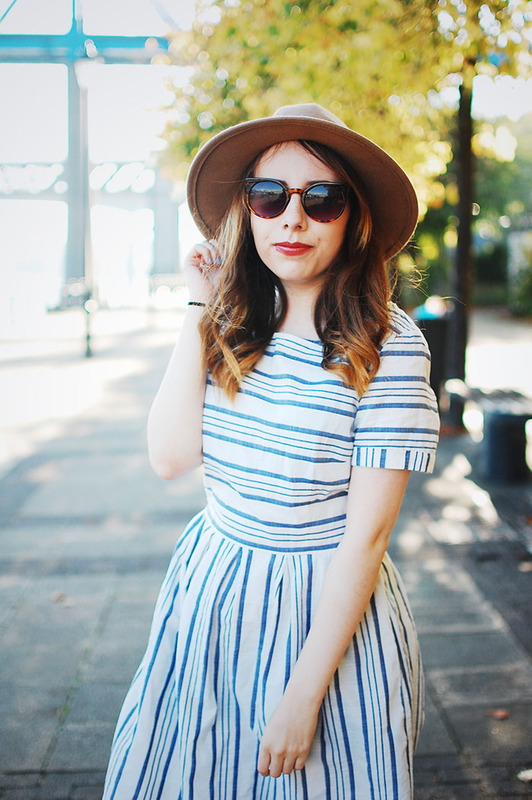 So hello, my name is Amy, and I currently blog over at The Girl In The Bowler Hat. I've been mentioned a few times on this blog before, as I take the majority of Charissa's outfit photographs (I hope you like them!) but I've never had my own post, so this is rather exciting, huh? I thought I'd show you some outfit photographs I shot the other week, whilst I enjoyed the last few days of summer in the North East before it was time to bring out the winter coat! I'm not really sure how I'd describe my style, masculine meets feminine with twist of sixties and pinch of hats maybe? I sure do love my hats, like my blog name would suggest. This beauty of a camel fedora I picked up a few weeks ago in Primark - I know right - and it's been glued to my head since. Even if I did end up having a man sing 'Inspector Gadget, Inspector Gadget' to me in the street just after shooting these photographs, I definitely think it's going to end up one of my autumn/winter staples, alongside this duster coat I absolutely love. The dress is one of those items of clothing that you love, yet forget you own and spends a lot of its lifetime gathering dust in the back of your wardrobe. I picked it up in Menorca a number of years ago whilst on holiday, and it's never really been worn since. 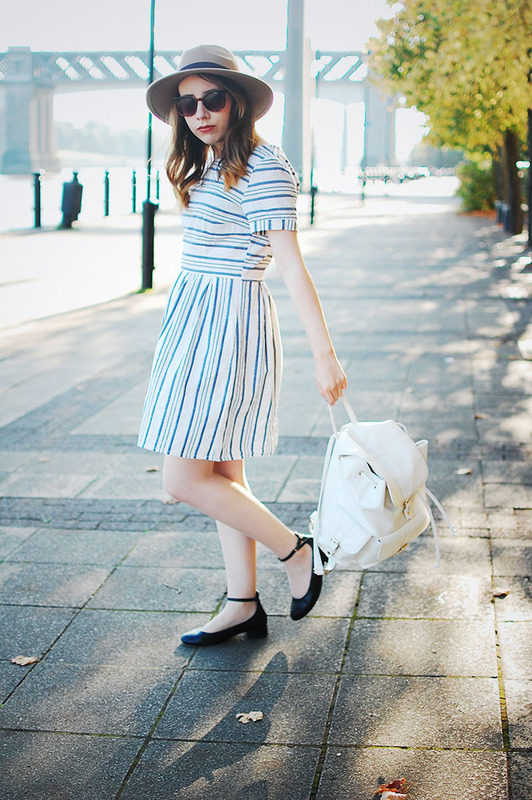 It's one of those dresses that makes you want to skip around on sunny days and that's exactly what I did! Keeping the rest of the outfit quite simple, I stuck to my trusty backpack which has done me well over the summer months and these rather battered looking shoes. Their dainty ankle strap gives them a lady-like vibe and I love that about them, anything remotely 60s is just my cup of tea! And just a little bit of self-promotion here, but I'd love it if you could check out my blog over at www.thegirlinthebowlerhat.com - I post regularly with outfits/lifestyle/beauty and it would mean the world. Let me know what you think! This look is super adorable ! Love the hat and the jacket ! This dress is so cute! You need to wear this outfit on a boat on the French Riviera! I love the idea of guest posts, I might do something like this. I love your dress, it's an absolute beauty. It just screams seaside at me.